Four Visitors in Three Weeks! As the end of November approached Delmar students were full of excitement and anticipation. Four of our on-line mentors were scheduled for a visit to our school. Prospector Parker, Mr. Dave Hess, Mr. D. Johnson and Mr. Matt Nelson came to Delmar, met with the students and everyone had wonderful visits. Prospector Parker came with the "Parker Playhouse" and Mr. D went to the 5th and 6th grade science classes and taught the students about the electrical system of the heart. Mr. Dave Hess and Mr. Matt Nelson told 'chilling' stories from their winter-over in Antarctica. We are so fortunate to have on- line friends who will come to school and meet us face-to-face. Parker Playhouse presented "Simple Simon"
Prospector Parker, A.K.A. 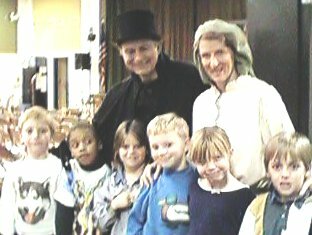 William Wills, came to our school, Delmar Elementary, on November 27, 1996 and put on a great play about Simple Simon, a Mother Goose nursery rhyme. One thing that I learned from Prospector Parker is what a prospector was. A prospector looks or searches for something. I write to Prospector Parker a lot. It is very fun to write to people on-line. I like writing to people on-line for many reasons such as it improves your typing skills, you get a lot of mail, and it's just plain fun!! I give up my recess and after-school time because I enjoy coming to KIDLINK and you never get bored. Plus, when it's cold, there's another good reason!!! 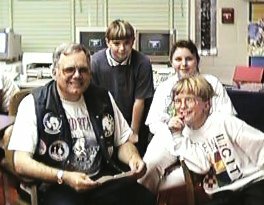 Mr. Dave Hess came to visit us on December 2, 1996. Mr. Dave told us about Antarctica. He talked about many things such as the animals he saw, the temperatures, and many other things. 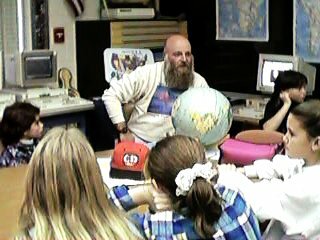 Mr. Dave came to visit us because he wanted to tell us more about Antarctica in person. Also he wanted to see us in person. I have learned that Antarctica is a very cold place and from what I learned from Mr. Dave I would not like to live there. Also it is very important to take Survival School. Mr. Dave blew bubbles and the bubbles froze in the air and then they fell to the ground and broke. When Mr. Dave was working his beard froze and he didn't know it until he was finished working. I wrote to Mr. Dave in the past quite a few times. It is fun to write to people on-line because your mail gets to the person really fast and sometimes you get mail back that very same day. I give up my recess to come to Kidlink because I learn a lot. Also I like to type on computers. And the main reason I like to come to Kidlink is Mrs. Weeg is a very nice person. 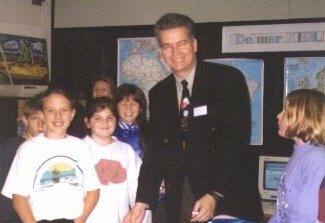 Mr. Delos Johnson came to visit the Delmar Kidlink kids on December 6, 1996. Mr. D writes to us about the heart. We write to him also. We ask him questions about the heart and he answers them. Mr. D visited us because he wanted to see us and tell us some more about the heart. I have learned where the pacemaker sits and what it does. There are wires, sometimes one sometimes two, that are put through a vein. I write to Mr. D just about everyday. It is fun to write to people on line because your mail gets sent fast and you get an answer back sometimes that very day. I give up my recess to write to Mr. D because I learn a lot . Also I like to write on computers. Hi!! My name is Ashleigh DeBord. I am eleven years old and in the sixth grade. The person I have chosen is Mr.D. Johnson. (Mr.D for short.) The connection Mr.D has with us is he is with the pacemaker project along with many others of my friends and me. He has taught us a lot. Mr.D came to visit us I think because he wanted to teach us about pacemakers in person not on line although he enjoys typing on the computer. I really enjoy writing to him. I have learned a lot about the circulatory in my classroom from Mr.D because when he came to visit he also taught our class a lot. Allthough I was not there to see this I know this from being on - line. On the first day of Kidlink everyone had someone to write to but then Mrs. Weeg said, "Why don't some of you write to Mr.D ?" He had sent us a real pacemaker in the mail. I did and from then on I have written to him. It is very fun to write to people on line. Especially Mr.D because he is a hard working man. Even if he went on a trip as soon as he gets back he writes to every single one of us there is and there is a whole bunch of us. He is also a very caring man. It is very fun to do this. You get to meet so many people. Sometimes the news comes but we do not come to try to be famous or on TV. We come to write!! We love it. On Thursday, December 12, 1996, Mr. Matt Nelson visited us here at Delmar Elem. We have been writing to him in Antarctica. We've been writing to him about Antarctica and how it is to live there. I think that he came to visit us because we have enjoyed writing to him and when we found out that he was coming home to Texas, we wanted him to come visit us. I think it was very nice of him to come all the way from Texas just to see us. See, he went home to Texas after he got back from Antarctica. Then, he came to see us. A few things that I have learned from him are how to survive in a temperature of -30 degrees, about penguins and how close you can get to them. The penguins are like the wild ponies here at Assateague Island. You can't get too close to them, you can't feed them anything, and you can't throw or touch them with anything. I started writing to Mr. Matt last year when he left for what was not the first time to Antarctica. I wrote back and forth to him many times last year. Then, this year when we came back from summer break, I started to write to him again. I think that it is fun to write to people on-line because, you can learn a lot of things and make a lot of friends!! I like to come down to Kidlink after school and at my recess time because, I enjoy writing to people. It is exciting when you sit down at a computer and start to write a letter. Then, in the next one or two days, you get a letter back from that person. It's a great feeling that you get when you realize that the letter that you are writing is going across the world to a person who sends their letter right back across the world. Mr. Matt also met five of the Summer School students who enjoyed writing to him during the hot summer days. They begged Matt to come visit them when he returned to the States and sure enough he did!